Departure: from Varadero or Havana. Day 1: Tour Bay of Pigs, Giron-Cienfuegos. « You can expect wonderful beaches and little bays perfect for snorkeling. « We will visit one of the largest environmental projects of the country – the crocodile breeding. « Tour along the Caribbean Sea and the famous Bay of Pigs to Caleta Buena, one of the most impressing diving and snorkeling destinations in Cuba. Day 2: Nicho Waterfalls, Mountains and Trinidad. 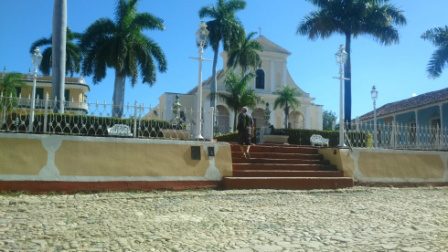 « Tour through the Escambray mountains. We will pass through little rural towns and villages, where you will have the time to exchange experiences with the people living there. Enjoy a traditionally brewed coffee and take pictures from the most beautiful outlooks of one of the highest vista points of the country (840 m above sea level). « Then we will take about a half a mile walk to the refreshing El Nicho waterfalls. Here you will have time to swim in the natural pools and enjoy nature. « Sightseeing of the city Trinidad with its cobblestone streets. Founded in 1514, it is the second oldest city of Cuba and was registered as World Heritage Site in the year 1988. « Visit of the city’s museum, the castle is one of the most elegant houses in town. « From the tower you will have a marvelous view over the historic city center. The hotel is located directly along the Plaza Mayor with the city palaces of the wealthiest families of Trinidad. « This gives you an interesting overview of the differing architectural styles with walls made of stone and clay and barred windows. Day 3: Tour Trinidad-Santa Clara-Varadero or Havana. 2 to 3 Person 425 EUR per person. 4 to 6 Person 390 EUR per person. • 3x lunch, respectively including one beverage (1x Bay of Pigs, 1x Nicho Park, 1x Santa Clara) see program. • 3 days private tour with a Jeep or car of an official car rental agency including fuel, insurance and parking. • 3 days professional English-speaking tour guide. • 24 hour-customer service of the RaimondReise-office.